Politkovskaya was a journalist and a human rights activist, strongly opposing the conflict in Chechnya and Putin's 'regime' in general. She was assassinated in 2006 in rather shadowy circumstances. Was she killed because of her activism? It seems to be the popular belief. Truth to be told, that's what tempted me to read the book. What information is so scary that you pay with your life for disclosing it? A Russian Diary is an extremely political book. Political as in - party such and such meets with such and such to discuss this or that while the public opinion polls show this or that. I find politics extremely boring, so the book disappointed me somehow. Even so, there are enough horror stories to freeze anyone's blood. Stories of people 'disappeared', tortured, threatened, afraid. The vision of Russia by Politkowskaya is scary indeed. One question remains - should we believe her? I can't give you a definite answer, I'm afraid. 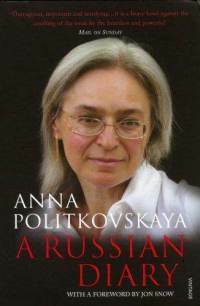 Politkovskaya's writing is very emotive, with plenty of condemning words and ready-made recipes for healing the society. Although I believe that 'a politician' equals 'liar' (so I should be on her side automatically) I found myself saying - hold on, that's unfair - again and again. This might be simply the influence of combative language, understandable in circumstances. Still, if she focused on describing the facts and gave up name-calling, the book would be far more powerful. A terrible thought crossed my mind when I was reading A Russian Diary. What if Politkovskaya's picture of Russia is as real as it gets? What if Putin really is the second Stalin and the world remains ignorant of this fact only due to his mastery of propaganda? What if? I find it quite hard to believe, but a shadow of doubt remains. Regardless of how true Politkovskaya's story is, it is easy to see why her death would be convenient to the authorities. Who is ultimately responsible for the tragic end of her life? We might never find out.